Let me start by saying this reporting is all observational. I didn’t go to San Juan, Puerto Rico, to dig into the island’s recovery efforts and reveal the pain and healing amongst the survivors. I went to get a tan. And to swim and drink rummy drinks and get away from sub-zero, dirty-snow Omaha, at least for a long weekend. We landed on a Thursday evening after a brief layover in Atlanta, our flight barely making it out of Omaha that morning in the midst of a severe snowstorm that had our white-knuckled Uber driver saying, “I’m stopping for the day after you guys, I don’t need this” and “You’ll be lucky if they don’t close Eppley.” They didn’t, but it took so long to de-ice the plane I wasn’t sure we’d make our connection. As we drove from Luis Munoz Marin International Airport to the La Concha Hotel, you’d never guess the area had been hit by a Category 5 hurricane just 18 months earlier. It looked like any other modern Caribbean cityscape with its clean paved streets, pastel-painted buildings and late-day traffic. But in what would become a series of discussions over the next few days with various taxi and Uber drivers, we got a glimpse of what happened the year before. “I was trapped in the upper floors of my apartment for a few days,” said Jose as he merged onto the freeway. Jose lived outside the city in an area with a Spanish name I can’t remember. He said there were laws against using generators in high-rise apartment buildings, and he had no idea how long he’d be without power, so he moved into a friend’s apartment in San Juan where power was back up in the newer parts of the city, and where he could at least find food and water. He ended up taking a job with the power company, rebuilding power lines outside the city. But it didn’t take long to find Maria’s impact. After we checked into our hotel, we walked down Ashford Ave. looking for the local beer and discovered Patrick’s Irish Bar & Restaurant, a building painted a garish Kelly green with a giant white shamrock in the middle. Its concrete second-floor deck looked out over a parking lot and across to a dilapidated seven-story hotel with boarded-up windows and walls streaked in air-conditioner rust that told the story of a business that wasn’t opening any time soon. Pink and purple Spanish-language graffiti covered the lower walls. Below, a small pack of stray cats — black, white, calico — tip-toed through parked cars looking for scraps of food or lazy mice. Meanwhile, just a block away, people in T-shirts and flip-flops ate sushi at a charming outdoor patio restaurant across the street from a Walgreens (Yes, they’re everywhere). 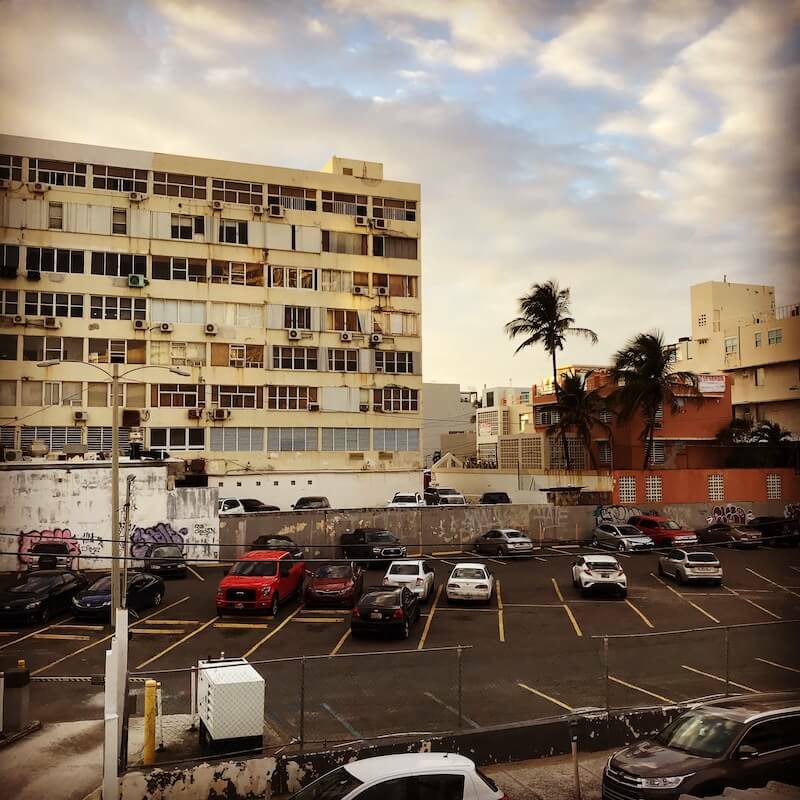 It was like that all over San Juan — gleaming modern resorts staffed by an army of bellmen in pastel-colored blazers stood alongside broken, vacant, multi-story condos that no doubt were worth millions before Maria came barreling through. What had happened to the owners? We’d never know. Palm trees lined the two-lane street, but for every third tree there was a broken trunk, presumably snapped by the wind, or just a stalk of a tree with a few new fronds beginning to grow back, or a hole in the concrete where a tree once grew. We spent most of our weekend at the beach and tried to swim in the rough surf. Red flags warned against swimming due to the treacherous undercurrent, but that didn’t stop spring-breakers in bikinis who bobbed up and down in the water before being battered by another wave. Toward the end of the trip, we took another taxi to Old San Juan, just a few miles up the coastline from our hotel. The driver said it received the worst of Maria and was the last to get power back because of its age. But as we walked the cobbled streets of Calle del Sol you couldn’t tell there had even been a storm. Its multi-colored, three-story buildings gleamed like Easter eggs. We made our way through the crowds of tourists and locals enjoying the afternoon and walked to a bay that fed back into the Atlantic where a row of monstrous cruise ships stood docked like enormous floating apartment buildings. From there we grabbed an Uber driven by a fit, bald middle-aged Puerto Rican named Omar. All the locals look fit in San Juan. “I almost went bankrupt after Maria,” he said, proudly telling us he’d just spent $2,000 on improvements to the BMW SUV we rode in that looked as if it just rolled off a dealer’s lot. He told the same story of flooding and destruction and weeks without power, all the time never complaining. “They still don’t have power in some places,” he said, pointing inland. In fact, the entire time we were in San Juan, we never heard anyone complain about anything let alone the federal government, whose embarrassing response to Maria will be one of the many things Trump will be remembered for after he leaves office. I asked Omar if he liked living in Puerto Rico. He said his dream was to return to the States. He grew up in New York City, where he lived with his mother “and didn’t have to work.” And now here he was, driving tourists around in snail-paced traffic, as sure a sign as any that San Juan was back. When we returned to Omaha, the snow had already melted, but a few days later, the state would be dealing with a catastrophe of its own. Garden of Eatin’Is Your Favorite Restaurant The Best in the Big O?